by »ter rurser j h y SISTER WENDY offered me a ] in# J a--a> could' " refuse. She'd give JLa TV J L i m e one of her watereolor paintings if! made a worktahle for her smdio. She sent me a rough sketch showing a long, low table with a shelfbeneath the top. Then I started thinking.Why not turn Wendy's worktahle into a prototype for something I could sell as a stock item in my booth at craft shows? Something everyone needs—a coffee table.This barter proved to be the start ofa design-and-budd process that produced four versions ofthis Shaker-style coffee table and culminated in the table you see in the front photo. It gracefully serves its purpose and is not difficult to budd. An ample overhang on the top. turned legs, and restrained design gives this coffee table a decidedly Shaker look. 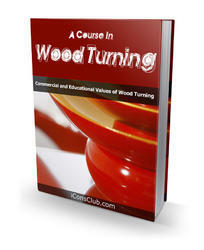 All joinery is mortise and tenon. Along the way, 1 tried three different leg designs, three approaches to the shelfand top construction, and several different dimensions on the top.Wendy's worktable, at 20 in. high, was a little too tall to correspond to most sofas. 1 lowered the second version to 18 in. and added a 48-in. by 23-in. top. The legs, turned from 1%-m. stock, were slightly tapered and ended at MV, in. at the floor (see the back table). Both the top and the shelf had breadboard ends. Although very useful, the table's narrow width reminded me of an aircraft carrier, and the legs ended up looking like cigars. A shortened incarnation, 36 in. by 18 in., wilh square, tapered legs followed (see the center table). 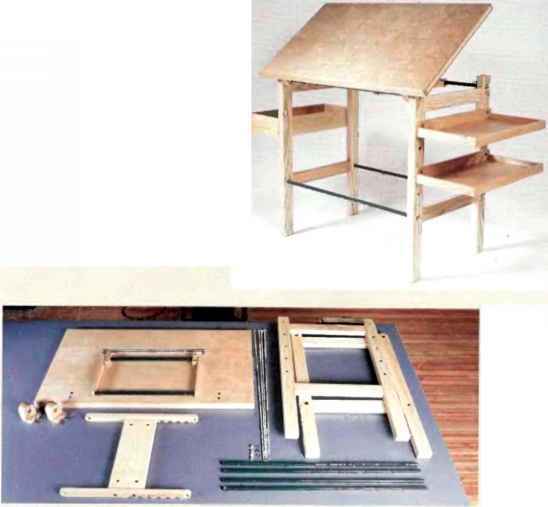 1 added a more intri cate breadboard design, one wilh multiple tenons, after 1 read an article by Garrett Hack describing his approach. That was as much to try a new technique as it was to provide more strength and slabdity. But some of these design features made the table too expensive. So to make the table easier and faster to budd (and as a result less expensive), I reduced its complexity while retaining its usefulness and grace. Breadboard ends were eliminated 011 the top and replaced on die shelfwilh a frame-and-panel design, winch 1 think is easier to make. And along the way, 1 refined the turned leg from its initial cigar shape to a more delicate form. The first of these simpler versions was 18 in. high with a 48-in. by 18-in. top. 1 finally settled on a slightly longer version, wilh a 60-in. by 18-in. top thai is V\ hi. thick.The shelfis % in. thick. KEEP TRYING. Peter Turner's work on this coffee table began with a request from his sister and a sketch (refer to opening photo). After several tries, he settled on a graceful design that he could build quickly. There aren't many pieces to this table, and it doesn't require much material — in all, about 25 bd. ft. of4/4 lumber and 4 bd. ft. of 8/4 wood for the legs. I use mortises and tenons tojoin both the apron pieces and the frame-and-panel shelfto the legs. 1 start by turning the legs from lX-in.-sq. stock. I'm by no means a master turner, so 1 use only a few turning tools on the legs: a roughing-oul gouge, a skew, a scraper, and a parting tool. The gouge does most of die work, and die only tticky part is mrning the pommel at the transition where die leg goes from square to round.The danger is chipping out corners oflhe leg where it remains square. So 1 use the tip ofthe skew to make a shallow cut at the transition point (see the top photo on the facing page), then a scraper to round over the corners very gently The delad I especially hke is the X-in.-wide collar at the transition from round to square (see the inset photo on the facing page). Once the legs are turned, 1 cut apron mortises in the legs and cut stile mortises in the shelf frame rails using a Mu 11i Router, which is a router-based joinery tool. But it doesn't matter how you cut the mortises. 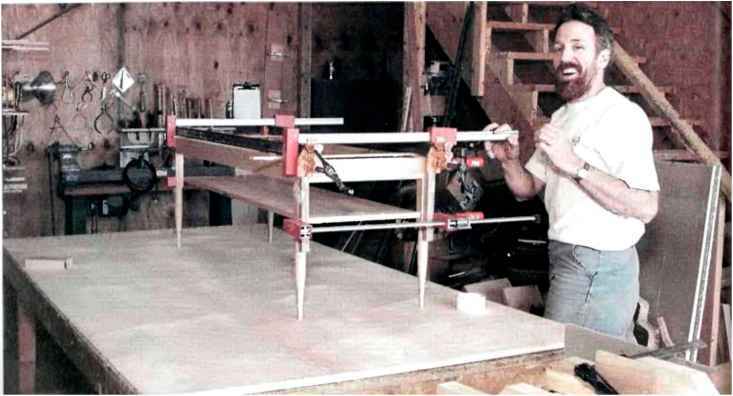 They could be done with a router, a mor-tiser, a drill press and chisel, or entirely by hand. 1 make grooves for the shelf in the frame parts on a tablesaw to match the mortises. When 1 cut apron and shelf frame tenons, 1 make sure the length between shoulders on both apron ends and shelf rails is identical so the legs stay square.This means I make the long aprons first and then the shelf, which has a %-in. by %-in. tenon at each corner. 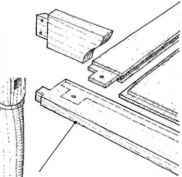 1 clamp a long apron between two legs and mark shelf mortise s in the legs directly from the shelftenons. Once the shou 1 der-1o-shoulder distance on the shelfis established, 1 cut the short apron pieces to match. the lime ofyear into account.Various books provide formulas for figuring out how much each species ofwood moves with changes in seasonal humidity. I fitted the panel in this table in early October, when the weather was still warm, so 1 guessed the wood was close to its maximum widtii. 'l'he reveals around the edge of the panel are sized accordingly. The panel is flush on both sides of the shelf. A tenon on each corner of the shelf fits into a corresponding mortise in the leg. I rough out these mortises on the drill press and clean them up with a chisel. THE TOUGH PART IS THE TRANSITION. The point where the leg turns from square to round Is easy to ruin. 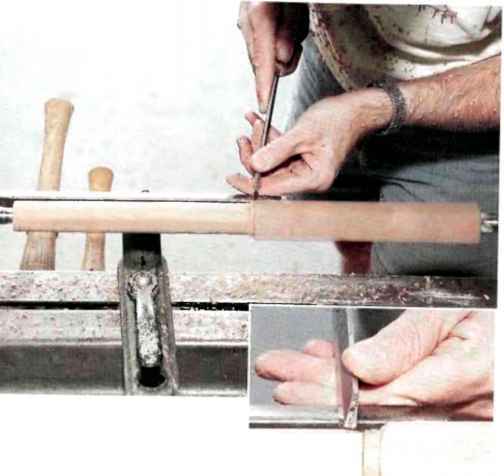 An Initial cut with a skew can prevent chipping. A parting tool (Inset) helps form the collar. attach the top, 1 use wooden buttons with tongues that fit biscuit slots cut on the inside edges of the aprons. After bringing everything along to 320-grit sandpaper, 1 finish it with three coats ofLivos od, which has a pleasant smed and produces a nice satin sheen. PETER TURNER makes furniture for a living in South Portland. Maine. An early version of this turned leg was in. dia. at the floor, but to the author, it looked too much like a cigar. He then developed this pattern, with a 54-ln.-dla. foot. Can't imagine a living room without a coffee table? The Shakers could. They didn't build coffee tables. To give my design a feeling that is reminiscent of Shaker work. I turned to my reference library. If you want to know more about the religious and social basis of Shaker craft, you can start with something called "Orders and Rules of the Church at Mount Lebanon: Millennial Laws of Gospel Statutes & Ordinances." This summary of Shaker habits-described in some of the books I used-was published for church elders in several versions between 1821 and 1887. Laws covered general approaches to furniture, and they could be very specific: The 1 845 laws required beds to be painted green and limited bedroom mirrors to 18 in. by 1 2 in. For the design of this table. I looked at photos of Shaker work. The greater the variety and number of photographic examples I absorbed, the stronger my vocabulary became in the elements of form, scale, proportion, and balance. This accumulated understanding allowed me to use specific design characteristics in this coffee table. Thin tops. 'A in. or % in., and ample overhangs. 2 in. to 3 in., on table ends are common on Shaker tables, so I adopted those elements here. The leg transition from square to collar to round came from a Shaker side table made In Enfield. N.H. 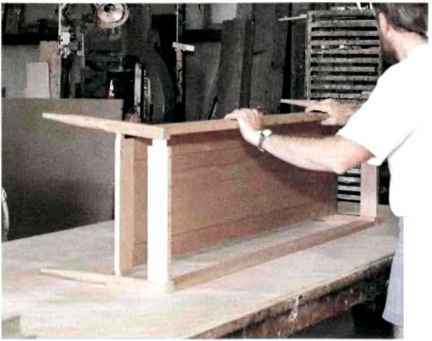 Along with sound joinery and little decorative elaboration, the prudent selection of design elements evokes a harmony and balance present in the majority of Shaker work. DON'TSKIPTHE DRY-FIT. Gluing up all the table parts shouldn't be a nightmare. A dry run pinpoints problems while they can still be corrected. The frame-and-panel shelf is completed before mortises for its %-in.-sq. tenons are laid out on the legs. Shelf is % in. thick. Ml joinery is mortise and l:enon. Apron tenons. K in. thickand % in. long. ;are mitered at the corners.